Truro Computer Services offer a complete solution for Computer Repairs, Ranging from All types of hardware to software repair solutions. Computer Repair, Mac Repair, Server Repair, Networking and Network Support. Computer Upgrades such as Processors, Motherboards and Memory all in stock. Both business and home users receive a service that is second to none.and Office visits can be booked for almost any time of the working day, also out-of-hours by arrangement. Many common problems with networks and pc’s can be solved on site, ranging from faulty modems and routers (following lightning strikes), software installation, broadband setup and network installation. Call our service number 01872 264350 to book a call. The shop also features a full service centre, where our trained engineers can complete more complex repairs. Laptop and Desktop servicing and cleaning and repair. Hard Drive Upgrades and lots of Laptop / PC Hard drives in stock. We are fully trained with XP, Vista, Windows 7, Windows 8 and Windows 10. We can solve almost all problems relating to these operating systems. There is no need to book a repair, just drop the pc or laptop in to the shop and we’ll book it in for you. 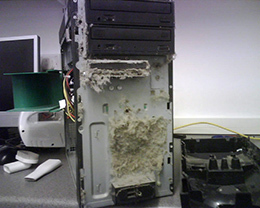 Not all cases of poor performance can be attributed to having an old pc, or needing to buy a new computer. Quite often a computer can be upgraded to breathe a new lease of life into it. In short; Processor, Graphics Cards, in fact almost every part of your pc needs to be kept cool. 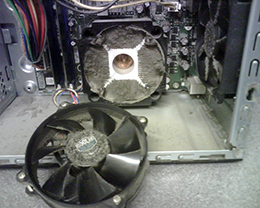 Dust build-up and clogging is one of the main factors in pc’s overheating, shutting down or becoming unstable. Air flow is so important for keeping all your components cool and running to their optimum. As you cans see from these pictures, there is absolutely NO airflow in these computers.